Personalized Mints in Bulk- Custom Peppermint, Spearmint, or Cinnamon Mint Packs (Wrappers). Promotional, Inexpensive. Lowest prices in USA and Canada. Bulk mint packs -wrappers, personalized with your logo or blank. Custom wrapped jumbo mints, individually wrapped, are the perfect complement for every promotion. 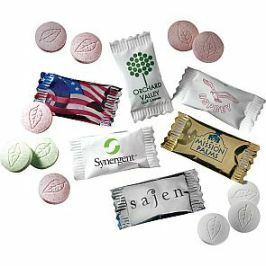 We supply 3 types of custom wrapped mints at the same price: Peppermint(GL1100), Spearmint(GL1200), Cinnamon(GL1300) . The standard production time is 10 working days, but we can supply the personalized mint packs much faster at an additional cost: please see the Price Table below. Lowest prices in the USA and Canada for wholesale custom wrapped mints . Free artwork design. American clients pay no taxes. We will send you a proof for your approval before production. Prices below are per Case of 2000 jumbo mints. Absolute Minimum Order Quantity: 2 Cases. Add $7.50 per case for Gold or Silver mint wrappers. No extra charge for white or clear wrappers. Setup Charge: $45.00 per color, per location. No additional charge per mint for additional imprint colors! Maximum 3 imprint colors. Standard Production: 10 Days after art approval. Rush production is available at extra cost (see above). Please multiply all US prices by 1.30 to find CDN$ prices. Packaging: Bulk, in Cases of 2000 Jumbo Mint Packs. Made in USA, FDA approved. Shipping: From New York State.